The controversial demolition of a St. Charles Avenue mansion leads the agenda for this afternoon’s meeting of the Neighborhood Conservation District Committee, which also includes properties in a number of other Uptown neighborhoods. 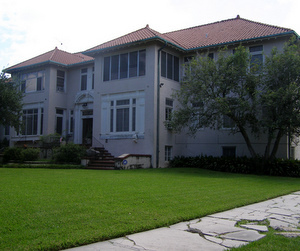 The home at 5428 St. Charles Avenue was designed by Emile Weil, the noted architect of landmarks throughout the city, and the Goldring family’s desire to tear it down and replace it with a building of their own design has upset neighbors and preservationists in the past. The request was slated for a decision last month, but deferred until today (Monday, Oct. 3) to give the family time to meet with opponents of the project. Other demolition requests include homes in Freret, Milan and Carrollton, as well as three properties in Central City, two in Hoffman Triangle and four in Hollygrove. A listing of Uptown properties on the agenda with links to photos by the Preservation Resource Center is below, pulled from their list of proposed demolitions across the entire city. The city has also published its complete agenda. Demolitions were requested by Owner unless otherwise noted. CLICK HERE to email NCDC and share your opinion about any of the proposed demolitions on the agenda. Look at that house on Clara. How was it ever allowed to deteriorate to such a state? It looks like it’s being swallowed up by plants. That didn’t happen overnight. This city needs to do a better job of code enforcement. Historic properties are neglected and allowed to decay to the point where demolition is the only option. How can we who are on the side of preservation possibly argue in favor of keeping a structure that’s a public nuisance or in danger of falling down? We can’t. At that point, those who would destroy our city’s architectural heritage have won without lifting a finger. I just drove by 5428 St. Charles Avenue. Crowfeet vine is now crawling up the side of the house in several places. Surely the owners could maintain this propperty. Is this the beginning of “demolition by neglect” on this property? or just a slight overlooking of maintenance? I don’t see any othr comments posted about St. Charles Avenue. Just the one about Clara Street. Different houses, different owners, different comments. It is my understanding that the new owner wants to tear down a deplorable multi family residence to be replaced by a beautiful single family residence. With the St. Charles Avenue Association and the Hurtsville Association both being in favor of demolition, there should be no opposition. The picture shows that this could possibly be the ugliest building on Saint Charles and is in no way a mansion as described on your blog. Thank God someone would want to replace it with a beautiful single family structure.